I cut out a whole pile of new quilts recently, so I’d better list the ones in progress. Christmas Cross – Ron & I picked it out. Blocks almost done. Green/pink/brown/blue – jelly roll I finally figured out what to do with. kinda Trip Around the world. Maybe 1/4 done, if that. Lots of tiny squares. Blue & Yellow bento box – all blocks done. need to lay out & put together. yellow/pink/orange – yes, this one is really bright. crazy eights pattern, which works up really fast. green/brown/red – Picture this, large blocks and I cut out enough for a queen sized bed because I am insane and it used up a lot of fabric. still have a lot left tho. edit: forgot the red/black/brown one – this was a brick pattern, but I pieced the big rectangles in a long strip to cut it up smaller, and like the big pieces too much. the fabric is pretty, so it will be 3 or 4 rows of HUGE rectangles instead of 24 rows of tiny ones. This doesn’t count all the finished tops waiting for quilting. I need batting. Friday afternoon, I went to Sew With Jo, and I *only* took 3 small quilts to quilt. Nothing to piece. Thereby forcing myself to get over the fear of quilting part. My plan was to use my walking foot on all the straight quilting I had to do across all three quilts, then use the other foot to do free motion. I got all the straight quilting done on the blue Christmas wall hanging that Mom made me, and I got almost every line done on the Yellow, White & Red Paddington baby quilt. I even bought a new blue marking pen while there. Then I ran out of bobbin thread. Did I bring extra? No. I can’t wind bobbins on the machine I had (long story) and Jo’s machine would not wind my bobbin. the store had no pre-wound bobbins. So I had to tell Ron to come get me. I had two and a half lines left until the quilt was DONE. Pooh. I did finish it after I got home, and wound up starting supper a half hour late, even tho I left early. This quilt is one in which I celebrate the mistakes. 🙂 While I was trimming the batting, I accidentally cut part of the backing level with the edge. My plan had been to fold the backing over to the front. So along that one side, I had to add a piece. there was also one block with a tiny chunk out of it that I had meant to put along the edge. It wound up almost in the middle of the quilt and of course I noticed it while quilting it. I just sewed extra stitching around it. 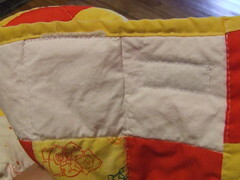 I also had a couple places where the binding didn’t quite catch and had to re-sew sections. If you look close, no doubt you can see these spots. I celebrated by stitching around my label, all the way through, so you can see a rectangle of stitches on the front. I used all cotton batting in it, which shrinks enough to make the quilt crinkle after your wash it, so I tossed it in a regular load and threw it in the dryer. Some loose bits showed up after that, and I just stitched them flat. This quilt? This is one for a new baby boy. I expect it to get loved and used, so hopefully with the imperfections celebrated, the boy and his parents will happily drag it around the house, build couch forts, use as a cape, cuddle it, throw up on it, and generally love it. Because it’s a quilt made with love. 🙂 And I am heartily in love with the batting and how it affects the finished quilt. 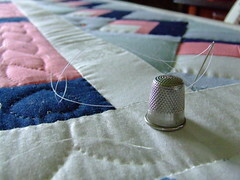 So, recently I have figured out some interesting things about the process of quilting. Yes, you’re thinking I have made a lot of quilts, but I want to make a distinction that I have made a lot of quilts *tops*. Now that I have this big pile, I seemed to have stalled at this point. I noticed the same thing in sewing clothing. I once made Ron a dress shirt in three days. Collar, yoke, placket front, flat felled seams and triangle sleeve plackets. Three! Days! And it took me two weeks to sew the buttonholes & buttons on. Hmm, why is that? Well, in the case of shirts, I really dislike sewing buttons on. Especially a long line of them. And making the buttonholes – I have just realized why I always hesitated on them and why I hesitate on the quilting part of quilting. See, the actual quilt tops I have finished all the way to completion is 5. 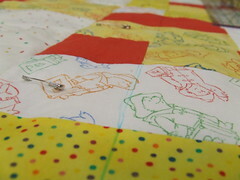 Four, if you consider I got someone else to do the quilting on our nap quilt. 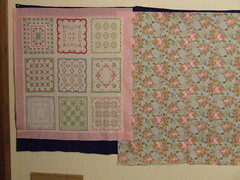 Three, if you discount the quilting I did on Meaghan green & purple quilt. So. I have sat here looking at my pile of quilt tops and basted quilts ready to go and wondered why I hardly did any sewing this week. part of it is a space issue. One of the waiting quilts is a fair sized – nap or twin, easy. The thought of wrestling it under my machine and knocking off everything else on my table is not something I have looked forward to. Especially on those days where I am cooking supper and waiting for the timer. Ten minutes? While I can sew a fair number of seams in ten minutes, when I get to the actual quilting part, ten minutes means I have the foot changed and the fabric smushed under and figured out where to start. 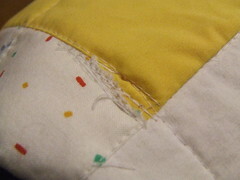 And doing a line of stitching halfway down the quilt and stopping – leaving it in the machine – just seems wrong. What if someone walks by and it pulls? What if I want to sew something else instead of continue? What if I screw it up? Ahhhhh… here we get to the crux of the matter. Every so often, I think of the term ‘perfectionist’ and how it applies to me. It can in some ways, and in others it does not. There are plenty of areas where close is good enough. I can fudge a few seams and not worry too much about it. At least not enough to rip it out and do it over and over if needed. But, like placing buttonholes on the front of a shirt for everyone to see, the process of quilting those lines and shapes across the front of the final piece is permanent. It is one of those things that is not only painfully visible, but painful to unpick. In a word, if you screw up, you really screw it up. And dang it, I wish I had an image of that Far Side cartoon, the one that says “Ray screw up” He’s in an orchestra with only one cymbal. That’s what I think about. Lest we end on that note (I got distracted searching for the cartoon) I decided a shift in my thinking was needed, and now I look at it this way: every quilt in the pile is *practice*. And if it’s not good enough to my liking, I can just finish it off, give it away, and make another one. I keep making progress on my quilts, as I am forcing myself to get off the computer and go do something else – especially if I don’t have it in my to actually work. Spacing out & doing fluff is…. well, fluffy. And I need the break. So. I’ve been powering through some of the sewing pile, and seeing it halfway down (and seeing some of my TABLE) was motivating. I told myself I can;t cut out another one (or start another one) until I get more tops done. Tonight I made *HUGE* dents in some of the tops I’m piecing. I just kept on sewing, and if I was at a point, I needed to iron, I just piled the pieces up and moved to the next quilt. I worked on THREE in less than two hours. The Christmas quilt I am dubbing Tacky Xmas has all the rows sewn together. I just have to press the seams and sew the rows. Then figure out the back, which shouldn’t be too hard, as I have a couple of large pieces of very loud Christmas print. I had been considering a flannel back as well. I may still do that, as this is for cuddling under over the holidays. It is for someone specific next Christmas. 😀 And that is all I am saying. It will torment you all year. 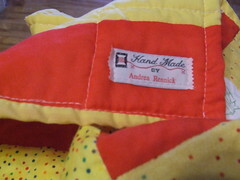 The other quilt is the red/white/yellow Paddington quilt. It is also done in the Yellow Brick Road pattern. I have all the rows sewn together, I just need to press them, then sew the rows on. I am undecided on the borders, which I may make narrower than the pattern calls for. Then I need to piece the back which will be mostly yellow. I’ve already purchased cotton batting for the inside, which will make the quilt look old and crinkly after washing. 🙂 It is for one of the new babies in our family and I hope to finish it before the kid is walking. 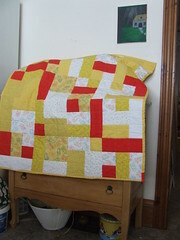 Lastly, I sewed more pieces on my yellow and red disappearing nine patch, matching up each square with one white piece. I got all the way through most of it until I ran out of white pieces (rectangles) I had pre cut. 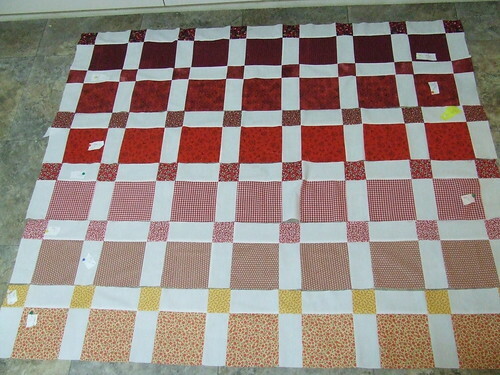 So, I need to press, pieces in rows, cut out more white & finish the last two rows, then sew all the rows together. I also dug out the leftover pieces from the last quilt, including some really large lengths. Enough to put in other quilts, but I will piece an interesting back, because it is what I do. Emma & I talked, and we decided on some sort of wave quilting pattern. While Emma would love for me to use the recycled batting, there’s too much white on the front and I don’t want the green tinge to come through, so I’ll probably use cotton. Speaking of things that happen for a reason, in other vague news there has been something I have been thinking about. It’s big and scary. I finally decided that I was going to wait for a sign before I moved forward. And lo, within an hour I got a very important email on just that. Lastly, almost all the baby wallpaper is gone from the old office. I hope to make way more progress on it this weekend, cleaning up the mess, scraping the remaining bits off the wall, and maybe getting Ron to start patching some rough spots. Seems weird to be right into quilting when the weather is getting increasingly hot out there. But I can hide in the living room, the Cave we call it, where it is still cool and blissfully dark. Oh, but I need a light for stitching. This quilt I kept having endless issues with. 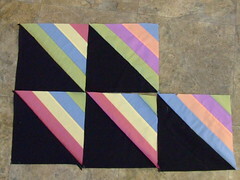 In an effort to use up some scraps, they were far too short for any speed strip piecing techniques. I would up spending more time fiddling with strips and ripping out seams than I did putting blocks together. I forged through until I got 16 blocks, then I stopped. It’s lap sized or wall hanging sized. It still needs a border, and then quilting. Not sure how I’m going to quilt it yet, or even what color thread. Then I think I may sell it. I am quilting my daughter’s quilt, on my mother’s quilt frame, with my grandmother’s tools. I have decided that while I like speed piecing techniques, I adore old-fashioned patterns and quilting. 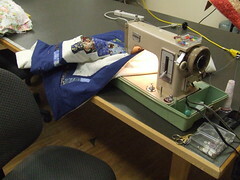 I like some machine quilting as long as it’s on a small machine. I don’t like long-arm computerized machine quilting. It makes the quilt look store bought, and then I think what was the point in that? And I am cursing myself over Sarah’s quilt. When I pieced it together, I had a new serger and sewed many of the strips together with that. then decided to hand-quilt it. If you don’t just go “ow” I’ll tell you why: serged seams are bulky and stiff. My stitches mostly skip them entirely. And there is a lot, as I also pieced the back. Yes, I have learned a ton of stuff since then. There’s two stacks of fabric waiting to be cut for quilt tops. One, the old soft florals for Ron & I, another, reds and yellows with white. Can’t wait to see it. I keep swapping out fabric until I am satisfied, and I have an idea for the block layout, but I’m not sure I can pull it off without overthinking, and I don’t want to mess it up either. It has to be enjoyable for me, this piecing together of fabric and pattern and color and shape, so they all work as a whole. I see it in my head, this quilt. The hard part is getting it out. Not sure if I want to hand-quilt a third quilt, especially a big one. But either of my machines are to cranky to machine quilt with. My mom will be loaning me hers to try, as an instructor told her it would do machine quilting quite well. If it does, and I get the hang of it, I’m sure I will be doing all mine and mom’s too. Oh wow, that’s ten. I’ve got it bad. Right now, I’m mostly trying to use up the stash, and picking out fabric combinations and trying to be inspired.